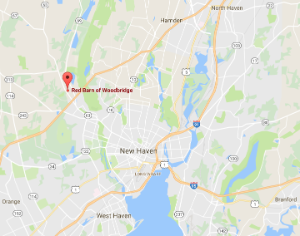 The original, quaint, antique red barn is located at the corner routes 114 and 63 in Woodbridge, CT, the main crossroads of this small, New England enclave outside of New Haven. Local lore offers that the building was moved from the middle of Woodbridge to it's current location in the early part of the 19th century, after which it operated as a gift shop and general store. 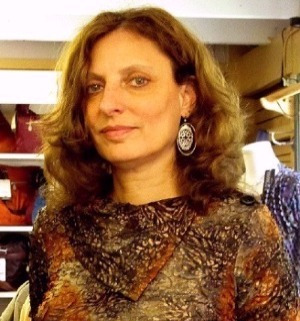 Current owner, Ellen Eisenberg, bought the business in 2007 and quickly turned it into a clothing and jewelry boutique, but continued to carry the many items the community was accustomed to buying there, including greeting cards, gifts, and toys. In 2016, Ellen moved her business out of the the barn and into the elegant Woodbridge Plaza at 245 Amity Road. The current store is now considered one of the best boutiques among those located in many towns that make up Greater New Haven. In Red Barn tradition, she continues to respond to the needs of the entire community by offering a wide variety of gifts for all ages in addition to the core clothing, shoes, and jewelry. The Red Barn of Woodbridge, in its contemporary form, has evolved into the bright and beautiful, airy and sophisticated store it is today. Ellen Eisenberg will celebrate her third anniversary as the owner of The Red Barn of Woodbridge on Oct. 20. A long time Woodbridge resident, Eisenberg worked as the marketing director for the JCC from 1999-2007, and every time she drove by the shop on her way to work she thought about how much she would love to own it herself. She calls it a, "Crazy mid-life crisis whim," but as soon as she saw the "for sale" sign she, "Whipped in, got it, and then told my husband." Eisenberg says her favorite part of owning and running a gift store is, "the aesthetics of it. I love carving out an environment and making it look how I want it to look." She does all of her own buying and goes to shows in New York, Boston and Canada looking for just the right merchandise to fill a specific space in the store. 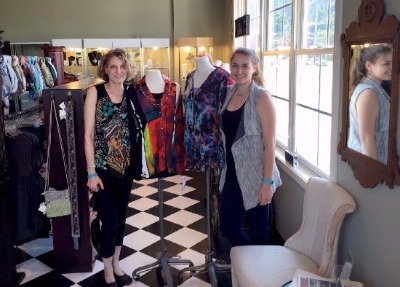 Her focus on the look of her store also influences how she staffs; some of her employees are Paier School of Art students, and they help her define and redefine the look of her shop. She also relies on them to help her bring in goods that appeal to a younger generation of shoppers. Two of the lines she carries specifically for her younger employees and their contemporaries are Big Buddha Bags and Hanky Panky Thongs. Another inspiration for her stock is her customer base. Eisenberg listens closely to what her customers want and will try most suggestions. The clothes she carries are mostly due to customer requests as are the Baggallini bags. Debbie Schlegel, a local realtor, says, "She (Eisenberg) really has her clients pegged. She knows what her customers want, especially clothes-wise." 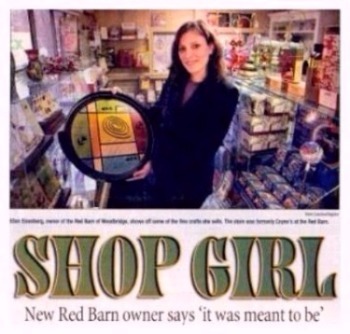 Schlegel often shops at The Red Barn of Woodbridge for house warming gifts for her clients. "I always find something unique and pretty, and I always get it gift wrapped. I like to leave and be done." Eisenberg says that many of her customers like the gift wrapping service for that reason. "People like that they feel like they are done when they leave. We are soup to nuts." Another convenience feature Eisenberg instituted after the economy went downhill is a lay-away plan. Although her biggest seller is clothing, a walk through the store provides a plethora of gift ideas. Despite the drop in sales since the economic dip, she still carries an assortment of body and skin care items including Crabtree and Evelyn, and AHAVA. The Red Barn of Woodbridge even has its own brand of natural and organic soaps. She also carries an extensive selection of candles including Vance Kitira. There is a corner devoted to books which features local authors like Binnie Klien, as well as books targeted for men. There are gadget-y gifts, jewelry from all over, children's gifts, wedding gifts and chocolate to list a few of the other items that fill the shelves. Eisenberg is getting ready for the holidays, stocking the Christmas room upstairs, and preparing as much as she can for the holiday rush and extended hours. The Red Barn of Woodbridge is open on Christmas Eve, and she says she expects to see all the last minute shoppers, mostly men, scrambling for their gifts and taking advantage of the gift wrapping, just like last year and the year before. 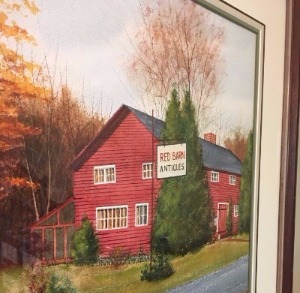 Ellen Eisenberg drove by Coyne's at the Red Barn for many years, harboring a fantasy that Joseph Coyne and his wife, Edwardene, would agree to sell her their gift store business. She even considered approaching them with the idea. "I'd say to my husband, 'Do you think I can ask Mr. Coyne if he wants to retire?'" Eisenberg said. But Eisenberg, who for five years ran the boutique just down the road at the Jewish Community Center of Greater New Haven, never quite got up the nerve. Then, last summer, a "Retirement Sale" sign went up outside Coyne's, at 378 Amity Road. Eisenberg, a Woodbridge resident who had shopped there often, drove by as Joseph Coyne was putting up the sign and figured it must be fate. She and the Coynes eventually struck a deal and about a month ago The Red Barn of Woodbridge - an institution of a slightly different name under the Coynes for some 40 years - opened with a new inventory that is different in many ways than what the Coynes offered, but equally unique. "I'm so happy in here, I feel like I won the lottery, Eisenberg said. "I always felt I was meant to be in a shop." The store carries gifts, boutique clothing, handbags and jewelry, as well as personal care and beauty products. Eisenberg said her biggest challenge is keeping prices reasonable. Joseph Coyne, who still owns the building, has been helping Eisenberg with the transition. Coyne, who misses customers most of all, said he and Edwardene, whose five children all worked in the store at some point, feel great about what Eisenberg had done. "She's doing a wonderful job," Joseph Coyne said. "Anybody getting into retail has to have an eye." Eisenberg said she wants every item to be special. "I ask my vendors. 'Am I going to see this at T.J. Maxx or Toys R Us?" she said. Former First Selectwoman Nan Birdwhistle stopped in recently and noted that, while it's sad to see the Coynes leave, it's also great the "Baton has been passed." "It's the best of the old with new panache to it," Birdwhistel said. "It's a perfect transition and I'm thrilled with it." While at the JCC, Eisenberg transformed the boutique from a tiny shop of Judaic items that was $40,000 in debt, to a thriving boutique. It is now closed with her departure, but she remains as marketing director for the organization. At the Red Barn, she carries many Judaic items and is taking advice from the Coynes on Christmas items, which she carries, but admits is a personal weakness because, as a Jew, the holiday is new to her. Eisenberg has always had the urge for retail, and in earlier days held some interesting jobs, including as Vice President of Creative Services both at New Line Cinema and Viacom. She helped launch the original "Teenage Mutant Ninja Turtles," and other cult films, as well as "The Montel Williams Show" in the early 1990s. She also owned a Norwalk photography business.